This guy started soccer this week. This year he is a Cinnamon Roller. He is excited to be there and even scored a goal. I picked up these bowls from anthropologie a couple of weeks ago. We have a few other of these small fancy bowls but wanted to add to our collection. We like to use them for chips, ice cream, and granola. I got this candle at Bath and Body Works a few weeks ago but only lit it this week. It has a mild scent, which I like, but very fresh. 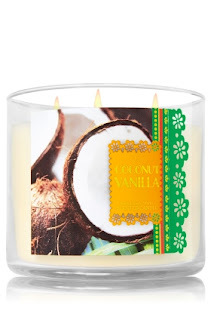 The coconut smells like summer to me. I saw this article yesterday. This summer there will be food stands in various subway stations selling healthy food, both as snacks or things you could take home to make supper. This is great; there are so many "food deserts" in our city, where it is hard to get to a grocery store, and people feel stuck to buy or order fast food for their families. Maybe this will help those busy commuters make some healthy choices! We are headed on a road trip today. E is pretty good at keeping himself entertained in the car, and we will stop for food on the way to break things up. I also printed off some car bingo sheets that should be fun. Great way to start the soccer season! Love that team name! Love the food stall idea and those bowls are so pretty!! Happy Friday!